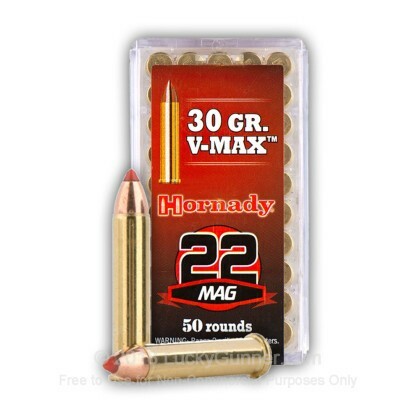 Hornady's 22 Mag V-MAX ammo will stop coyotes and other varmints dead in their tracks. This 22 WMR ammo leaves the barrel at 2,200 FPS and features a flat trajectory providing accuracy out to 125 yards with a devastating terminal performance upon impact. 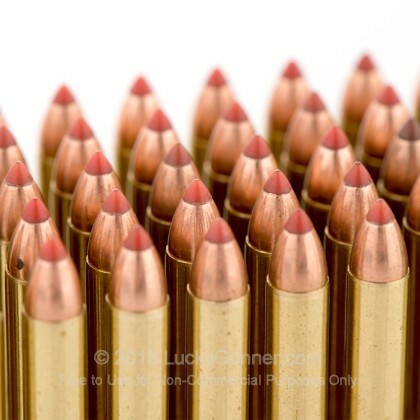 This ammunition is brass cased, rimfire primed, and is non-reloadable. Once again Hornady delivers a superb product. Rarely do I stray from Hornady brand ammo. This is very fast and flat shooting .22 mag that one can nearly "rag hole" a target. Super accurate and it feeds and cycles well in my lever gun. I have 2 other brands that do ok and one that is made from thin, cheap, junk brass and won't eject. 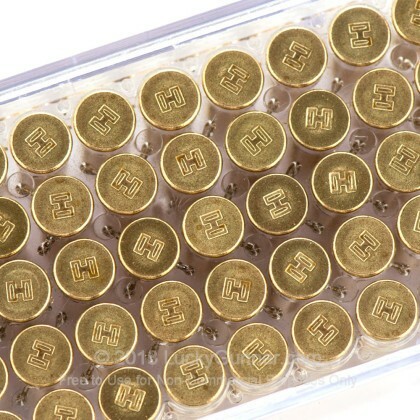 Hornady makes the best ammo in the business! This review is more about LuckyGunner than it is about the ammo. 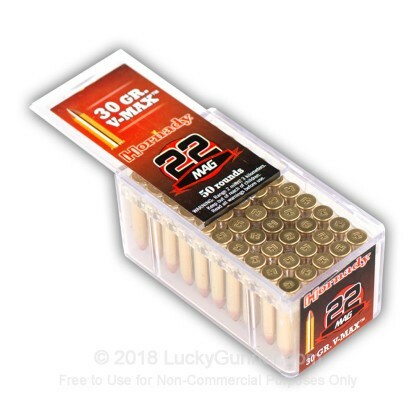 This particular ammo is difficult to find but Lucky Gunner had an ample supply in stock and the shipping service was excellent, as always. 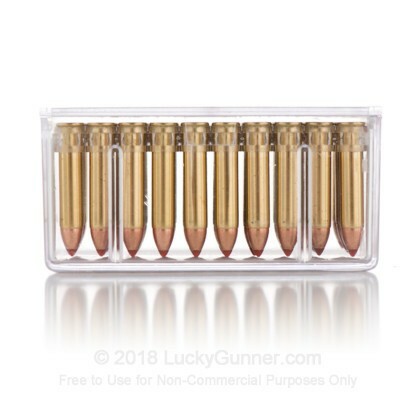 I am a repeat customer and will continue to shop Lucky Gunner first for all of my ammo purchases. I am very pleased with the ammo; it shoots really well with my Savage 93. Absolutely no problems in my NAA Mini Magnum Revolver! Very dependable Ammo! Exellent in my Savage 93. Devastating on coyotes! Haven't been target practicing or hunting since we can't get a quality Made in USA bullet. Took us two years to find 22 mag in stock online. These are a great product from the Joyce Hornady plant. Usually use CCI since they are made close to home, but can't get them either on the West Coast. I was using Winchester hollow points and had ground hogs still get back to their holes. I tried the Hornady ballistic tips and have yet to loose a ground hog. I was impressed !! EASY SITE TO ACCESS THE PRODUCT YOU ARE LOOKIN' FOR AND REASONABLE PRICES. 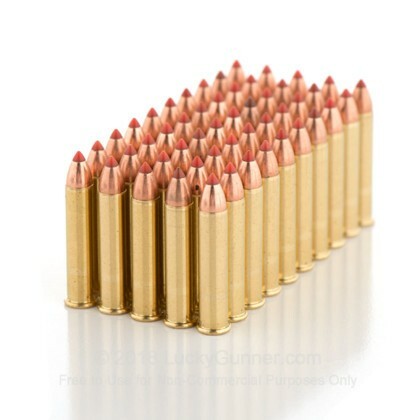 This is some of the most accurate ammo that I have used. Functions well in my Winchester 9422m, my magnum research 22m, and my kel-tek pmr 30. functions flawlessly in all 3. There do not seem to be any bargains (price wise) on the ammo. best i have ever shot for 22 mag. excellent groups, and deadly on small game. Very accurate and fast and deadly. Tested in a Ruger 77/22mag with a 23" lilja barrel. A: Hello Darcy, These 30gr. V-MAX rounds by Hornady are in .22 WMR, which will not work in a .22 LR firearm. You will need .22 LR rounds for your .22 LR firearm. 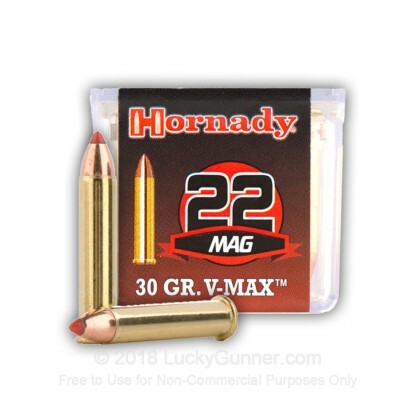 We also have this 22 WMR - 30 Grain V-MAX Polymer Tip - Hornady Varmint Express - 500 Rounds ammo in stock in a bigger quantity.